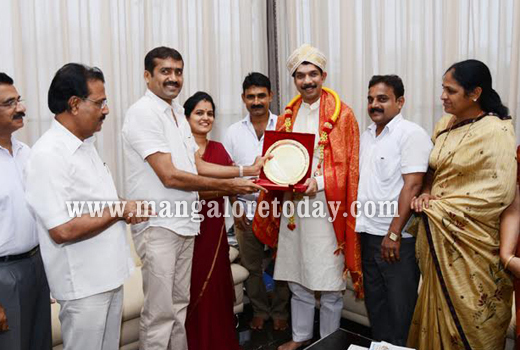 Mangaluru, June 17, 2015 : As part of the nation-wide ‘Maha-Sampark Abhiyan’ of the BJP, party leaders in the district led by local MP Nalin Kumar Kateel on June 17, Wednesday visited the houses of members who were enrolled recently through the party’s missed call drive. They even collected personal details of the new members. 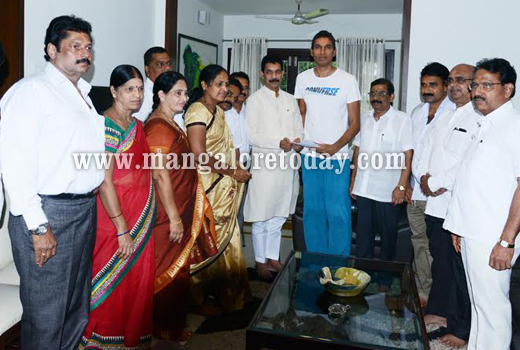 Party men visited the residence of former CREDAI Mangaluru chief Pusharaj Jain and businessman Dheeraj Amin at Kadri Shivabagh who filled the requisite forms and officially became members of the party. Jain even felicitated Nalin on the occasion. Speaking to reporters on the occasion, the MP said as part of the campaign the party will sensitize the people about the party’s goals as well as the achievements of the Union Government led by Prime Minister Modi. He said people who have enrolled as members through missed call can also visit the booth level offices of the party and fill the forms to officially become members of the party. Nalin informed on the occasion that 2.5 lakh people have given missed calls in the district as part of the drive.